A ‘SERIOUS DISTURBANCE’ at a prison in England has been resolved, the security company which manages the facility has said this morning. Disorder broke out at HMP Oakwood near Wolverhampton last night and was sustained through 2.00am today. Local police in riot gear were drafted in to help resolve the issue. According to Sky News, up to 60 inmates were involved across the five-hour disturbance. It is not known exactly what happened but it is understood that some weapons were used. G4S, which runs the prison, remained tight-lipped on what it described as an ‘incident’. Investigations are now underway, it said. 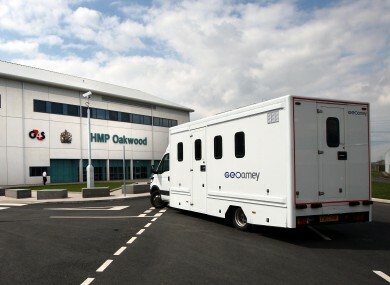 Oakwood is England’s largest jail, housing 1,605 men. It was subject to a surprise inspection last year after which it was criticised for having inexperienced staff and high levels of violence and drug dealing. Most of the inmates are categorised as ‘C’ prisoners who are defined as those who cannot be trusted in open conditions but are not considered capable of escape. Email “'Serious incident' at UK prison involved 60 prisoners and lasted 5 hours”. Feedback on “'Serious incident' at UK prison involved 60 prisoners and lasted 5 hours”.